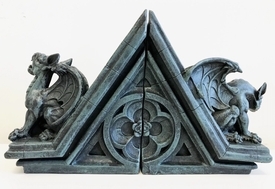 The listing is for Gargoyle display stands only. The action figures are not included. This is one pair of 1/12 Gargoyle display stand for 6" action figures from Mezco, Marvel Legends, Spawn etc. The stand is made with high quality resin with aged stone look. The bottom has velvet lining to prevent scratching the bookshelf.